Known worldwide for their cost-effectiveness, Drager’s short-term gas detection tubes are a reliable means of measurement. 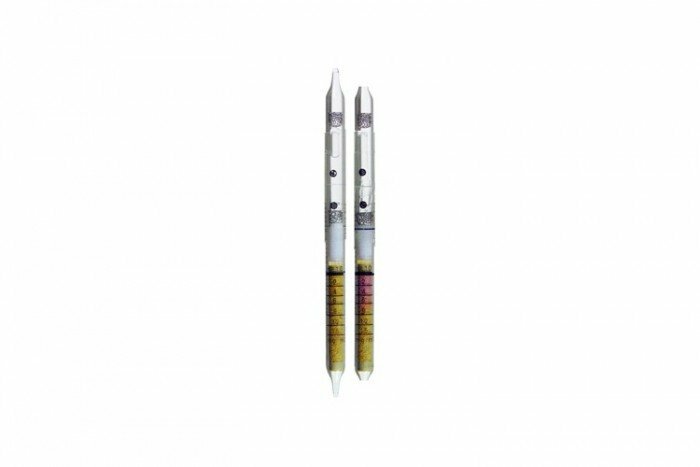 The Cyanide tubes have a measurement range of 2 to 15 mg/m3 and come in a pack of 10 tubes. Please note this product has a shelf life of 2 years. Free hydrogen cyanide is indicated already before breaking the ampoule. Acid gases are indicated with different sensitivities. A certain portion of the cyanide can have reacted with the CO2 in the air through hydrolysis. It is impossible to measure cyanide in the presence of phosphine. After carrying out the 10 strokes the reagent ampoule must be broken, the liquid transferred onto the white separating layer and carefully drawn through with two strokes in cyanide free air using the pump. The indicating layer must not become moist.